Scandals and Incivility in Congress: Do Legislators Face Consequences? In a new submission to Democracy Papers, Tracy Sulkin looks at the professional consequences of legislators’ bad behavior. Using a unique dataset on professional scandals and instances of incivility committed by members of the US House of Representatives, she shows that scandals and incivility are linked to stalling professional career trajectories of members of Congress. In an era of polarization and gridlock, these results indicate that Congress does retain ability to police and sanction bad behavior among its members. 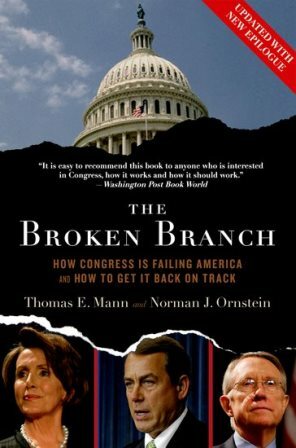 Contemporary portrayals of Congress often depict an institution in peril—the “broken branch,”1 New York: Oxford University Press, 2008More Info → characterized by heightened ideological polarization and partisan rancor, low levels of public approval, intractable policy gridlock, and an inability to adequately perform its oversight functions vis-à-vis the executive. 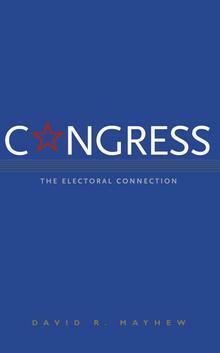 In response, academics, journalists, public officials, and other observers have sought to evaluate Congress’s capacity to fulfill its constitutional role, most commonly assessing its success at lawmaking—the ability of individual members, party leadership, and the institution as a whole to craft legislation, overcome partisan differences to reach compromises, and make good public policy.2For examples, see E. Scott Adler and John Wilkerson, Congress and the Politics of Problem Solving (New York: Cambridge University Press, 2013); Sarah Binder, Stalemate: Causes and Consequences of Legislative Gridlock (Washington, DC: Brookings Institution Press, 2003); and David Mayhew, Divided We Govern (New Haven, CT: Yale University Press, 1991). However, a second, equally important, indicator of the health of Congress is the ability of legislators to self-police within and across party lines to punish “bad” behavior and encourage adherence to norms of ethics, hard work, civility, and reciprocity. In this piece, I argue that even in an era of relatively extreme polarization, norms regarding behavior continue to exist. By focusing on these norms and the consequences for their violation, we gain a better understanding of how institutions and rules in Congress work to support collaboration among legislators. When and how do scandals and incivility have legislative consequences? In particular, after an instance of bad behavior, do members of Congress face more difficulty in seeing their legislation move through the process, building coalitions, or obtaining positions of leadership within the chamber? The answers to these questions bear on the ways in which good behavior benefits both individual members and the chamber. While such analyses are undeniably important, they only tell part of the story. Most members involved in transgressions, even those as obvious as scandal, do successfully return to Congress for at least one more term. Accordingly, at any given time, some members of Congress are acting under the shadow of perceived misbehavior. In response, their colleagues may choose to disassociate from them, for reasons noble and/or strategic. For those members of Congress who violate a congressional norm, three basic patterns of consequences are possible. The first, of course, is that such behavior has no effect at all on legislators’ trajectories—that colleagues either do not care or look the other way, or that other factors swamp the effects of the transgression. 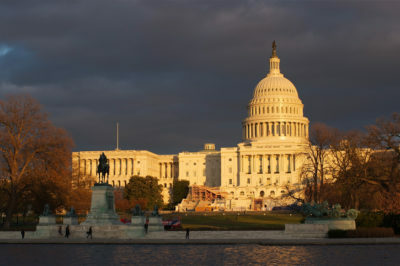 The second possibility is that these members of Congress experience decreases in success after a violation—that, for example, they have lower rates of legislative effectiveness in the congress after a scandal, act of incivility, or violation of reciprocity than in the congress before. This would indicate a very strong effect, as it assumes that norm violation dials back the original successes of members and also overshadows the general advantage of seniority that accrue over time. A third possibility is that transgressions work to stall members’ legislative careers—that they do not necessarily experience less success than before, but neither do they enjoy the upward trajectory of their peers. Although more subtle, such a pattern also constitutes an important legislative effect. Consider the effects of two indicators of ethics and decorum—whether a member of Congress was involved in a scandal and whether he or she engaged in an act of incivility. The former includes accusations of professional malfeasance such as abuses of privileges of office (e.g., improper use of official resources, nepotism), corruption (bribery, tax evasion), campaign finance irregularities, alleged sexual harassment of staffers, and the like, as well as personal imbroglios such as revelations of alcoholism and drug use, extramarital affairs, and crimes such as DUIs, assault, and solicitation.6For more details on the measurement of scandal, see Collin Paschall, Tracy Sulkin, and William Bernhard, “The Legislative Consequences of Congressional Scandals,” Political Research Quarterly (forthcoming). For incivility, I focus on language that violates long-standing congressional norms of tone in discourse.7See Lawrence Dodd and Scot Schraufnagel, “Congress and the Polarity Paradox: Party Polarization, Member Incivility, and Enactment of Landmark Legislation, 1891–1994,” Congress & the Presidency 39, no. 2 (2012): 109–132. The incivility data reported on in this paper was generously provided by Scot Schraufnagel. Such instances involve communications from one member to or about another that involve name-calling, insults, or the threat of violence. My research focuses on the House of Representatives over a span of three decades, from the 101st to 113th Congresses (1989–2014), during which 1,300 individuals served in the House. While most admirably represented their constituents and discharged their duties to the chamber, I identified approximately 300 instances of scandal, affecting 249 members of the House of Representatives, and 55 instances of incivility (that warranted mention in national newspapers) involving 40 members. To explore how scandal and incivility shape members’ success, I focus on four measures of such success—their Legislative Effectiveness Scores (as developed by Craig Volden and Alan Wiseman),8 New York: Cambridge University Press, 2014More Info → which reflect their success at moving legislation through the process; how central they are to congressional cosponsorship networks;9See James Fowler, “Connecting the Congress: A Study of Cosponsorship Networks,” Political Analysis 14, no. 4 (2006): 456–487. whether they hold a leadership position in the chamber; and whether they have a seat on an exclusive committee. As a starting point, figure 1 shows the over-time success for members who were not involved in scandal or incivility in a particular congress. As expected, legislators generally enjoy an upward trajectory. Compared to their past selves, they have significantly higher legislative effectiveness scores, are more central to cosponsorship networks, more liable to have a seat on an exclusive committee, and more likely to hold a leadership position. Thus, for these members, the passage of time brings rewards within the chamber. Does the same hold true for their peers who are implicated in a scandal or act of incivility? As shown in figure 2, the comparison is stark. These members of Congress do not enjoy increased success—their network centrality scores are no higher, they are no more legislatively effective, and they are no more likely to rise to leadership positions. This supports the hypothesis that bad behavior works to stall legislators’ career success.11When I break down misbehavior by type (professional scandals, those related to members of Congress’s behavior in office or on the campaign trail; personal scandals, related to imbroglios in their private lives; and incivility), I find that the strongest consequences accrue for professional scandals. The over-time changes in legislative effectiveness and cosponsorship network centrality are significantly lower for these members, and their likelihood of losing an exclusive committee position is significantly higher. There is less evidence that personal scandals and incivility matter for the careers of members of Congress (at least by these measures of success), though incivility does lead to decreases in network centrality, which is perhaps where we’d most expect to uncover a result. Somewhat surprisingly, those involved in personal scandals are actually less likely to lose a leadership position than are their peers, but I caution against making too much of this result, as the n is fairly low. 12Note: The figure presents members of Congress’ levels of success (mean scores) at congress t -1 and congress t + 1 for legislators who were involved in scandal or incivility at congress t, with differences assessed using paired-samples t-tests. These illustrations provide initial evidence that norms of good behavior are alive and well in the House of Representatives. The consequences of deviation are real—members of Congress who break norms may face negative legislative consequences that affect their success. As a result, the ability of the House to self-police is a positive signal about its health and capacity. Put another way, even during these challenging times, there is an underlying infrastructure that promotes good behavior. By exploring members’ ability to police themselves, this project offers a novel take on a question that is at once age-old and increasingly at the forefront of the minds of those who care about our constitutional system: Can Congress work to meet the challenges of the modern era while also achieving the potential envisioned by the framers and guardians of the institution for the past two centuries? 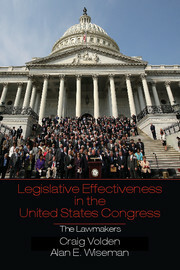 For examples, see E. Scott Adler and John Wilkerson, Congress and the Politics of Problem Solving (New York: Cambridge University Press, 2013); Sarah Binder, Stalemate: Causes and Consequences of Legislative Gridlock (Washington, DC: Brookings Institution Press, 2003); and David Mayhew, Divided We Govern (New Haven, CT: Yale University Press, 1991). Scott Basinger, “Scandals and Congressional Elections in the Post-Watergate Era,” Political Research Quarterly 66, no. 2 (2012): 385–398. 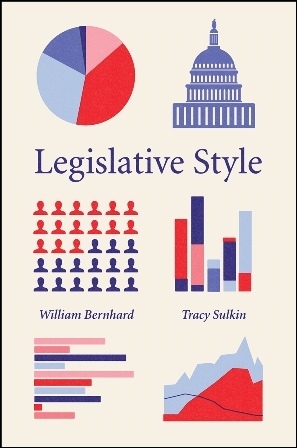 For more details on the measurement of scandal, see Collin Paschall, Tracy Sulkin, and William Bernhard, “The Legislative Consequences of Congressional Scandals,” Political Research Quarterly (forthcoming). See Lawrence Dodd and Scot Schraufnagel, “Congress and the Polarity Paradox: Party Polarization, Member Incivility, and Enactment of Landmark Legislation, 1891–1994,” Congress & the Presidency 39, no. 2 (2012): 109–132. The incivility data reported on in this paper was generously provided by Scot Schraufnagel. See James Fowler, “Connecting the Congress: A Study of Cosponsorship Networks,” Political Analysis 14, no. 4 (2006): 456–487. When I break down misbehavior by type (professional scandals, those related to members of Congress’s behavior in office or on the campaign trail; personal scandals, related to imbroglios in their private lives; and incivility), I find that the strongest consequences accrue for professional scandals. The over-time changes in legislative effectiveness and cosponsorship network centrality are significantly lower for these members, and their likelihood of losing an exclusive committee position is significantly higher. There is less evidence that personal scandals and incivility matter for the careers of members of Congress (at least by these measures of success), though incivility does lead to decreases in network centrality, which is perhaps where we’d most expect to uncover a result. Somewhat surprisingly, those involved in personal scandals are actually less likely to lose a leadership position than are their peers, but I caution against making too much of this result, as the n is fairly low. 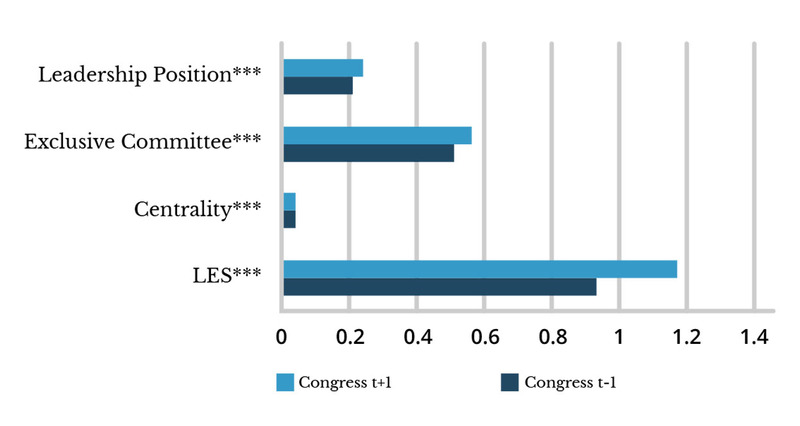 Note: The figure presents members of Congress’ levels of success (mean scores) at congress t -1 and congress t + 1 for legislators who were involved in scandal or incivility at congress t, with differences assessed using paired-samples t-tests. Tracy Sulkin is dean of the College of Media and professor of political science at the University of Illinois, Urbana-Champaign. Her research focuses on legislative behavior and representation and she is the author of numerous articles and three books on Congress, including Issue Politics in Congress (Cambridge University Press, 2005), The Legislative Legacy of Congressional Campaigns (Cambridge University Press, 2011), and, with William Bernhard, Legislative Style (University of Chicago Press, 2018).